Triple A Launch Games: Are They Even Necessary? Nintendo either dodged a huge bullet with 3DS, or pulled off one of best strategic moves in gaming history. 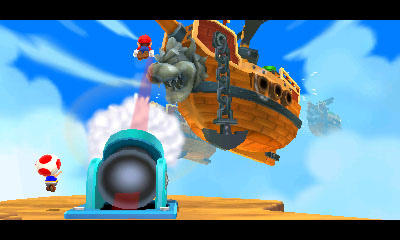 One of the biggest criticisms of the Nintendo 3DS launch was a noticeable lack of Mario. What nerve Nintendo had bringing its new system to market without a game starring the mustachioed mascot. After all, how could the big N ignore a history of proven success with consoles and handhelds that appeared alongside a Mario title? Super Nintendo and Super Mario World, Nintendo 64 and Super Mario 64, Game Boy Advance and Super Mario Advance, DS and Super Mario 64 DS...all proven winners. Would people have bought 3DS at $249.99 had Super Mario 3D Land been there day one? Instead, we received Steel Diver, Pilotwings Resort and Nintendogs + Cats. Critics slammed Nintendo president Satoru Iwata. Even fans expressed disappointment. And yet...3DS closed the year with record sales, thanks in large part to Nintendo's decision to release both Super Mario 3D Land and Mario Kart 7 during the busy holiday shopping season and within mere weeks of each other. We'll never know if this was planned or not. Regardless, it worked impressively well. Both games easily became million sellers, while the 3DS caught fire in every territory, allowing Nintendo to sell more in eight months than DS sold in a year. That said, how important is a system's launch games? To that end, is it OK to release good but not great titles, then wow consumers several months later? Or did Nintendo enter a perfect storm that began with the 3DS price drop in August and catch a lucky break? Sony probably thinks so, which is why the publisher has apparently gone to great lengths to assemble the biggest, most star studded launch in history for its PlayStation Vita handheld that arrives February 22 in the U.S. and Europe. Right away, players will have access to Uncharted: Golden Abyss, Wipeout 2048, Ultimate Marvel vs. Capcom 3, FIFA Soccer and Rayman Origins, with another batch of games (Unit 13, Gravity Rush) appearing within the launch window, leaving us to wonder what's in store for Vita months afterward. On that note, there does appear to be a science to system launches, and many players feel the games, not the hardware, are most important. If that's true, Nintendo pulled off one of the biggest comebacks we've seen.